Looking for an easy Christmas treat for kids? These cute, edible Christmas presents are made with Rice Krispie Treats and ribbon candy bows. They are quick and simple, and no baking is required! Read below for tutorial and video. I love making festive, pretty treats during the holidays, but I also want to keep things simple. Inspired by my kids (who adore rice krispie treats and Airhead Xtreme candy), I created these “presents,” which are a fun variation of regular rice krispie treats. You can quickly whip these together to add flair to a Christmas cookie tray or give as a gift to friends. These would also be fun to make for a kids’ school Christmas party. Of course you can create these using from-scratch rice krispie treats, but if you want to make things even easier on yourself, opt for the store bought, pre-packaged variety. Once you get the hang of creating the candy bow, these little present treats come together really fast. I’ve posted a video below on the bow making process, which will help you understand the steps. Wash your hands! This is a given with any recipe, but since you’ll be handling the candy quite a bit, you’ll want to make sure your hands are nice and sparkly clean. Cut Airheads in half lengthwise using kitchen shears or clean scissors. For each treat package, set aside 3 full length strips of one color and two 1.5 inch pieces of the same color. Wrap one full length candy strip lengthwise vertically and one horizontally over the treat. Push gently but firmly into the sides and bottom of the treat so that it sticks. Take the third full length piece and create a bow shape as shown in the video below. Remove the toothpicks when you’re ready to serve. Any questions? Just email me or post a comment. 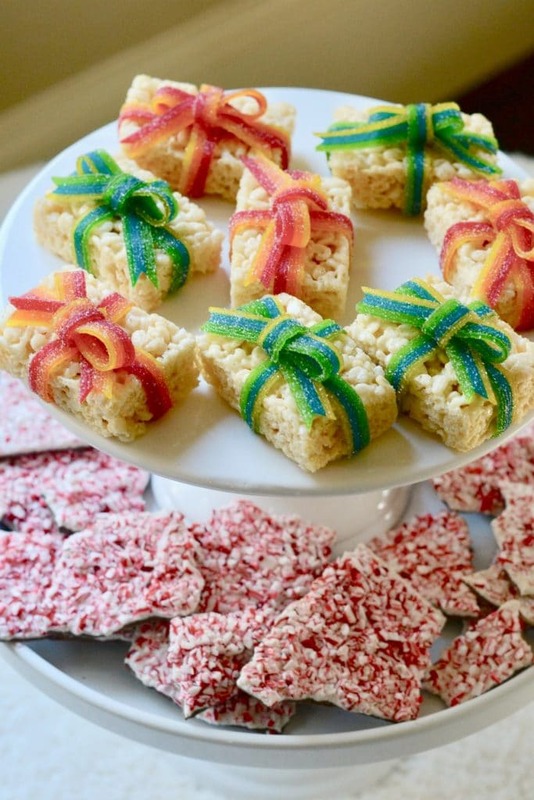 Use homemade or store bought rice krispie treats to create a fun and festive Christmas treat. For each treat package, set aside 3 full length strips (5 inches each) of one color and two 1.5 inch pieces of the same color. Take the third full length piece and create a bow shape (see video). Use a toothpick to secure the bow onto the top of the "present." Using clean scissors or kitchen shears, clip the bottom ends of the bow to create an inverted "V."
Remove the toothpicks when you're ready to serve. *You'll also need a clean pair of scissors and toothpicks for this project.